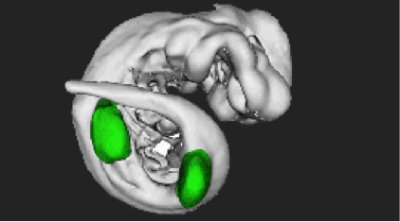 3D reconstruction of a mouse embryo. Limbs are highlighted in green. 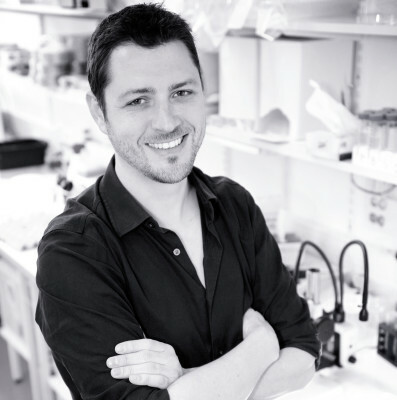 Jérôme Gros and his team are interested in the role of cell behaviour (cell shape, movement, division, etc.) in tissue morphogenesis and how it impacts patterning of different structures during embryogenesis of higher vertebrates. They use an integrative approach ranging from classical embryology, molecular genetics, cellular biology, state-of-the-art live imaging microscopy and biophysics to understand how cells and molecular cues interplay to shape tissues during embryogenesis. Limb defects, which are amongst the most frequent congenital malformations in humans, are the result of deviation in normal developmental program deployment affecting limb specification, initiation or patterning. In most cases the mechanisms underlying limb abnormalities are, at the best, poorly defined. This is in part due because despite considerable advances in our understanding of normal limb morphogenesis, on a molecular level, fundamental aspects of limb formation are not understood at a cellular level. Thus, we still have a very incomplete picture of limb formation that prevents further progress in our understanding of this process. We propose to elucidate the role of dynamic cell behavior in the consecutive steps of limb specification, initiation and patterning. The elucidation of the cellular events underlying the different steps of limb development, together with their molecular regulation, represents crucial missing information, which will undoubtedly push forward the frontier of our current knowledge of normal limb formation. Importantly, these studies will provide an integrated and comprehensive framework for understanding the mechanisms underlying congenital limb malformations. Cell Division Drives Epithelial Cell Rearrangements during Gastrulation in Chick.